Renewable targets for 2020 “will not be met” by many nations around the globe. That’s according to the latest renewable energy ‘Country Attractiveness Indices’ (CAI) report from Ernst & Young released today, which rates the UK as the fifth most attractive place for investors in green energy, topped by China, the USA, Germany and India. But the UK only just made the top five because of a fall in Italy’s ranking following the nation’s economic downfall, the analysts behind the report said. The global services provider said Japan could meet its renewables target following the nation’s “post-Fuskushima ambition”, while Germany and China are likely to follow suit. However the challenge for China is to ensure its renewables are actually grid-connected, suggests the report, as around 20-25% of wind power are not yet linked to the main power system. The firm suggests “radical reforms” are necessary for investment opportunities and to help increase the likelihood of 2020 targets being met for many economies, especially the UK. 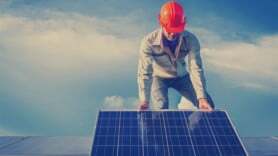 The company also claims by 2020, Asian and other new economies could be the “prime drivers” of the renewable industry rather than the EU.